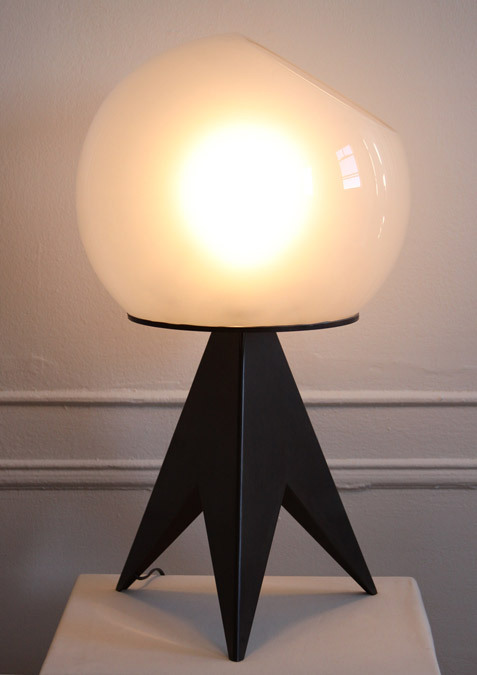 The Orb Lamp features a 14" hand blown glass orb sliced on an angle with a polished glass edge. The glass orb detaches from the metal base for transport and assembly. The glass orb attaches to a metal base constructed from steel and finished with a gray blue patina. Accepts medium base (standard) light bulbs with on/off switch attached to cord. If needed, the lamp can be disassembled with each part fully recyclable. Designed in Brooklyn & Made in the U.S.A.